The band's first all-original effort, hewing close to the turning inside-out of Irish folk traditionalisms started by the Pogues and continued by their modern contemporaries. 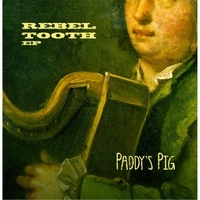 Paddy's Pig expands its universe with this 2016 EP, with 5 new songs, ranging from the historical to the personal, from the traditional (O'Carolan melody "South Wind" with new original lyrics) to the modern. Adding Jon O'Hara's bass and guest instrumentalists (Robert Keysers of American Wake on fiddle, Jerry Wheeler of Poxy Boggards on dulcimer, Jen Almiron on fiddle, and Dani O'Terry on cello), REBEL TOOTH is another step forward by one of So Cal's stalwart Irish bands.